Resolutions toward peacebuilding - at home and for the world! This year, I will acknowledge how conflict presents an opportunity to enrich relationships. This year, I will make amends with people and not let our differences of opinion fester. This year, I will apologize and mean it. This year, I will stop blaming others. This year, I will take responsibility for how I contributed to disputes. This year, I will forgive and let bygones be bygones. This year, I will not be hard on others, or on myself. This year, I will not judge people. This year, I will value the importance of respecting other people’s opinions, even if I don’t agree with them. This year, I will listen. An unattributed story from the Associated Press in last week’s paper recounted how a Mormon bishop in Taylorsville, Utah, (a suburb of Salt Lake City) had a make-up artist radically change his appearance so that he would be unrecognizable even to his own family. He dressed like a homeless man and showed up prior to Sunday services at his own church and interacted (or tried to interact) with the congregants. A couple gave him money, a few (especially children) spoke with him, but most hurried past him and didn’t want to speak to him or even look him in the eye. During the service, he approached the pulpit and revealed who he was—to the shock of the congregation. He was quite surprised that people were so taken aback. He told them that he didn’t pull this as a stunt and certainly did not intend to shame anyone. He simply wanted to hold up a mirror so that they could think about how they interacted with others. It is reminiscent of “some have entertained angels unawares” (Heb 13:2, KJV). If we treat everyone with grace and gratitude, whether at the holidays or not, ultimately what we will have created is a more gracious and inclusive community. Sometimes it takes a 2,700 year old chalice to make peace! A Chalice toward friendship - for Iran and the U.S.! 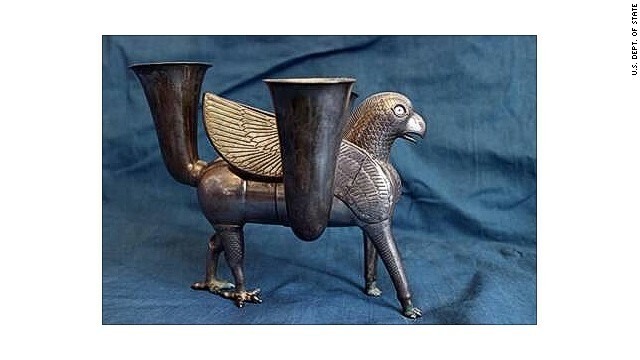 A 2,700 year-old silver chalice may be a new token of friendship between the United States and Iran. Iran's cultural heritage chief hopes its return will mark a lively cultural exchange with the U.S.
Mohammad-Ali Najafi says the ice between Washington and Tehran has thawed. "I adamantly believe in cultural diplomacy, and I believe the thing that could improve relations between US and Iran after the years and softens the harshness of this relationship is cultural diplomacy." A group of people get together to mow unkempt parks so children can play! Two minute video - inspiring creative urban renewal. Urban Innovation Exchange: The Mower Gang from DETROIT LIVES! on Vimeo. Empower new ecologies for the future. A blog entry by Professor Jennifer Browdy de Hernandez focuses on current news - and the continuing news of our ecological crisis. A reading worth reflecting upon. Iran's New President & Peace in the Middle East ! Iran's new president is talking about peace! Let's hope it becomes possible! Iranian President Hassan Rouhani said it was important that countries across the Middle East learn to peacefully coexist. "We are not seeking ... and looking for war with any nations. We are seeking peace and stability among all the nations in the region," Rouhani said. 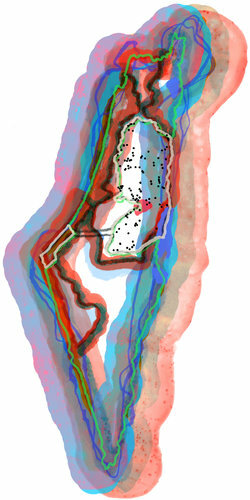 An article posted to the New York Times today, critiquing the "Two-State Solution" as "Illusion." There are many things great about the article. (1) A recognized and long-term expert in the region offers commentary over decades. (2) The positions advocated note the complexities involved in any possible future. And, (3) the author articulates a "third way" compared with what has been espoused and has not worked for decades. There is NO single easy solution to the conflict in the land. And yet, reasonable persons can find ways to move forward peaceably recognizing a unified solidarity in shared humanness. Obama & Putin & Playgrounds in life. I’ve been trying to make sense of Obama’s aggressive, speech-making and threats which have not been characteristic of his Presidency. I wonder if the vitriolic, aggressive ‘trash-talk” of Obama and Putin is really about the fact that Putin got former U.S. NSA employee Edward Snowden on his “team” and that single “draft choice” has set off rivalrous desire and the need to retaliate from Obama’s psyche. Syria might just be the most direct situational factor for two individual men to expose their self-serving rivalry. Except, these “Captains” possess very real weapons and this is no game and no playground. A thoughtful agent of peaceful action in our world is John Franklin Hay. He offers his thoughts on what the President of the United States should say and do now to help with the conflict in Syria. His words offer deep insight for our consideration on A Better Way than Bombs and Militarism. 1. Provide vigorous relief and support to all who are victims of violence . . . .
2. Pivot . . . and vigorously make the case for freedom and human rights. . . .
3. Contemplate deeply the failed and costly military interventions in Afghanistan and Iraq . . . .
4. Stop saber rattling . . . Using violence to end violence has lost its effectiveness. 5. Demonstrably reduce the role of the Defense Department, the military and militarism across the board . . . .
6. Change the role of the military to a more purely defensive posture . . . . The word “defense” describes what it should be. 7. Develop and consult with an independent panel on creative international nonviolence. . . .
8. Define "national security threat" to include only direct threats. . . .
9. Continue to appeal to and work for common ground with all UN Security Council members. . . .
10. Reset and invigorate all diplomatic efforts . . . to influence a negotiated settlement to their civil conflict. 11. With a delegation of diverse world leaders, personally meet directly with Assad and rebel leadership to appeal for a cessation of conflict and a brokered settlement. 12. 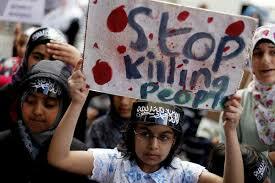 Call upon all Middle Eastern nations to work directly with Syria to broker a cessation of conflict and settlement. Respect and encourage intra-regional capacity for settling regional issues. Interfaith Lecture & Conversations - October in Oklahoma! Edward Snowden - and Collaboration with Violence - Am I guilty? I've been too busy with too many things to think through the myriad and complex issues involving all aspects of Edward Snowden, the NSA leaks, and all the issues engaged. And yet, I am suspicious of calling Snowden, who is exposing troubling activity a simple "criminal" - or "spy," "traitor," or "whistle-blower." There are so many complex issues involved. In the midst of this, though, I've been thinking about complicity in patterns of violence with regard to the Snowden situation. I teach and talk about these issues when I teach about the Holocaust. I raise issues about the fact that leading up to and in the midst of the Holocaust - the world needed persons to exist who were agents of positive social change who refused to perpetuate or stand by when violence and hatred was engaged. At the link I'm providing - the author Robert J. Burrowes raises questions I will explore as I read and re-read his post, provided at the Fellowship of Reconciliation (FOR) website. Some people have accused Bradley Manning and Edward Snowden of being traitors. But this obscures a deeper and more important question. If the government of the United States is engaged in endless acts of lawless violence, as the documentary evidence clearly demonstrates (See Fred Branfman, “World’s Most Evil and Lawless Institution? The Executive Branch of the U.S. Government”), then it is not Manning and Snowden who are the traitors for providing evidence of this violence and the surveillance necessary to carry it out. The real traitors are all of those other employees of intelligence agencies who say nothing while they collaborate with the endless and often secret perpetration of violence by the U.S. government and its allied governments in our name. Why does this matter? It matters because it tells us that thousands of individuals are willing to collaborate, without the intervention of analytical thought, compassionate feeling, or conscience, with the use of violence. And that bodes ill for our society. Kenneth C. Davis writes for the Smithsonian in this article about the history of the founding of America - and the religious issues and problems of early settlers. While I am no expert on American History and I have a few misgivings about some specific statements of the author's perspectives in a few places, I am certain the history he highlights is more true than we care to remember and a reminder that the hopes of America were for the good of the all - toward eupan. America can still be, as Madison perceived the nation in 1785, “an Asylum to the persecuted and oppressed of every Nation and Religion.” But recognizing that deep religious discord has been part of America’s social DNA is a healthy and necessary step. When we acknowledge that dark past, perhaps the nation will return to that “promised...lustre” of which Madison so grandiloquently wrote. 1,000,000 bones on display - National Mall - Washington D.C.
After years of planning - partnering with thousands of persons around the world - under the leadership of fellow Carl Wilkens Fellow Naomi Natale, her inspiring idea about a large scale art exhibit to raise awareness about Genocide - will come to full reality this weekend! I'm thankful for many persons from Oklahoma - and persons in OKC and many students from SNU & SWCU (where I teach) and Putnam City Public Schools and Bethany Public Schools nearby - to have been participants in the project. More news at this link from the Washington Post. What a GREAT way to connect people! It is great to know & work with people of no faith who work for peace - and people of deep faith who work for peace. I just learned of the Shomer Shalom Network - a movement within Judaism dedicated to the study and practice of Jewish nonviolence as a way of life. Members span the denominational spectrum from Hasidic to Secular. They affirm an identity as Jews who want to replace war, economic injustice and violence with restorative justice, nonviolence and peace. They are about Stewarding Peace! While I only know of them from their website posts at this time, their projects sound entirely in line with our efforts toward eupan. I hope to get to know them more - and know you can get to know them as well. I don't follow Hollywood actors or particular Television Shows - though I recognize figures here and there. I recognized Sir Patrick Stewart - from his roles in Star Trek - and felt compelled to watch this video when it was linked with this information entirely copied from the BuzzFeed.com website. A powerful 7:47 video of a Question and Answer described here, and worthy of your time for the story that is narrated. Powerful. "While at Comicpalooza, a girl asked Sir Patrick Stewart a question about what the most important thing he’d ever done besides acting was. His answer was his work with campaigns against violence toward women, which led to this impassioned answer and wonderful gesture." Sir Patrick didn’t even hesitate, he smiled, hopped off the stage and came over to embrace me in a hug. Which he held me there for a long while. He told me “You never have to go through that again, you’re safe now.” I couldn’t stop thanking him. His embrace was so warm and genuine. It was two people, two strangers, supporting and giving love. And when we pulled away he looked strait in my eyes, like he was promising that. He told me to take care. And I will. A compelling story that reminds us that the work of eupan is not just about large scale violence, massive casualties or major exploitation or harm. The work of eupan begins in homes and with families, with a better understanding of all relationships.